Within the town of Brussels, Belgium, there is a town square called Grand-Place. Grand-Place is considered one of the most beautiful places in the world and has been listed on the World Heritage List by UNESCO since 1998. Grand-Place was constructed on a dried up marsh. Markets have been located on this spot since 1174 AD. Surrounding The Grand-Place is Town Hall, guildhalls, and the Maison du Roi or Kings House. The original buildings were heavily damaged in 1695 by the French Army. Reconstruction began a year later and was finished relatively quickly. In an effort to protect the Grand-Place from modernizing, Brussels has created an ordinance that keeps a certain area surrounding the Grand-Place from making updates. The city wishes to keep the area as original as possible so visitors can experience the areas origins. While you are exploring the surrounding area, keep an eye out for Brussels oldest resident, the naughty Mannekin Pis! Brussels does many things within the Grand-Place however, one of the more special things that they do is the Flower Carpet. 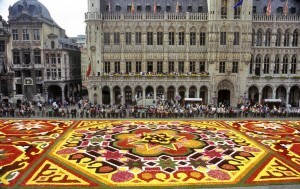 Every 2 years, for one weekend in August, over 100 volunteers create a masterpiece out of flowers in the center of the Grand-Place. The flower carpet is 79 by 253 ft and uses roughly 1 million begonias! That is a lot of flowers. The Flower carpet was started in 1971 by a landscape architect named E. Stautemans. 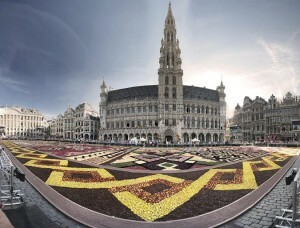 If you are lucky enough to find yourself in Brussels, make sure you visit this amazing square. The Grand-Place is truly a unique place to explore! This entry was posted on Thursday, January 9th, 2014	at 2:39 pm	. You can follow any responses to this entry through the RSS 2.0	feed. Both comments and pings are currently closed.